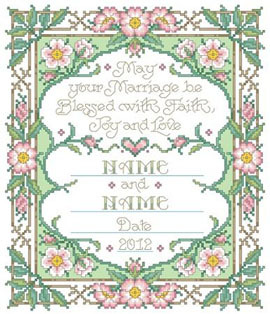 Honor the vows a couple make to each other on their wedding day with a simple floral sampler. The happy couple will be delighted to receive such a lovely reminder of their love. Each PDF download comes with a full color image, chart, DMC floss color guide, general instructions / stitch guide and alphabet for personalization. Contents: Stitch Count 123w X 145h, Finished Size on 14ct: 9" x 11"